VIENNA — Iran nuclear talks busted through their second deadline in a week Tuesday, raising new questions about the ability of world powers to cut off all Iranian pathways to a bomb through diplomacy. The talks, already in their 12th day, were prolonged until possibly Friday. “We knew it would have been difficult, challenging, and sometimes hard,” said Federica Mogherini, the European Union’s foreign policy chief. She said the negotiations would continue despite hitting some “tense” moments, and the State Department declared the current interim nuclear arrangement with Iran extended through July 10. As the latest target date arrived for a deal setting a decade of restrictions on Iran’s nuclear program, U.S. Secretary of State John Kerry, Iranian Foreign Minister Mohammad Javad Zarif and other top diplomats huddled in Vienna in search of a breakthrough. All had spoken of deep differences remaining, and there was no public indication they had resolved disputes ranging from inspection rules on suspicious Iranian sites to limits on Tehran’s research and development of advanced nuclear technology. Still, no one was speaking yet on Tuesday of a long-term extension. “The last, difficult, political issues, we have to solve,” Mogherini said. And as he left the talks for an economic summit at home, Russian Foreign Minister Sergey Lavrov said fewer than 10 major differences needed to be ironed out, including access to Iranian sites for international monitors. He said questions related to the easing of sanctions on Iran had been decided, Russian news agency RIA Novosti reported. Lavrov said he could return to the talks later in the week. Diplomats had extended their discussions by a week when they missed their goal of a pact by June 30, after passing previous deadlines in July 2014 and last November. 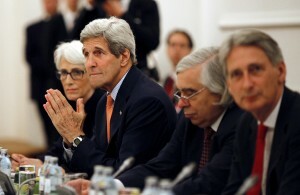 For Kerry and his team, pressure is increasing from skeptical U.S. allies and members of Congress. If the accord isn’t sent over to American lawmakers by Thursday, their month-long review period would be doubled to 60 days, hampering the ability of the Obama administration to offer speedy economic benefits to Iran for nuclear concessions. In Tehran Tuesday, Iran’s Atomic Energy Organization declared it had reached a “general understanding” in parallel talks with the U.N. nuclear agency on “joint cooperation.” The Iranians have made similar claims previously, and it was unclear if any process was established for the International Atomic Energy Agency’s long-stymied investigation of past nuclear weapons work by the Islamic Republic — a demand of Washington and its partners in negotiations in Austria’s capital. There, in a baroque, 19th-century palace, Kerry gathered early Tuesday with the foreign ministers of Britain, China, France, Germany and Russia. The larger group was to meet with Zarif at some point later in the day. Russia’s Lavrov and China’s Wang Yi had to leave for a gathering of emerging economies in the Russian city of Ufa starting Wednesday, and the EU’s Mogherini said different ministers were likely to depart and return. “We are taking these negotiations day to day to see if we can conclude a comprehensive agreement,” State Department spokeswoman Marie Harf said in a statement, adding that Kerry would remain in Vienna. The U.S. is in a tough spot. President Barack Obama has expended significant political capital on finalizing an agreement that has prompted suspicion from Iran’s regional rival, Saudi Arabia, outright hostility from America’s closest Mideast ally, Israel, and deep ambivalence even among Obama’s Democratic allies in Congress. They’re concerned that the accord would leave Iran’s nuclear infrastructure largely intact and compel the West to provide the leading U.S.-designated state sponsor of terrorism with potentially hundreds of billions of dollars’ worth of economic relief from international sanctions. To ease their concerns, Obama and Kerry have vowed to hold out for a “good deal” that verifiably keeps Iran at least a year away from a nuclear weapons capability for at least a decade. Current intelligence estimates put the Iranians only two to three months away from amassing enough material for a nuclear warhead, if they pursued such a course. As part of the guarantee, the administration has repeatedly threatened to abandon negotiations if they prove fruitless or appear as an Iranian stall for time. Republicans hostile to compromise with Iran have been urging the U.S. to pull back from the talks. Their refrain has been that Obama and Kerry want a deal more than the Iranians do, and have let red lines erode on Iranian enrichment capacity, inspections and providing limited sanctions relief. The president and his top advisers vehemently reject such claims. Iran has its own red lines, defiantly outlined in recent weeks by Ayatollah Ali Khamenei, the nation’s supreme leader. They include a quick easing of sanctions, and rejection of any inspections of military sites or interviews with Iranian nuclear scientists. Associated Press writer George Jahn contributed.